Caramel Apple: Our homemade caramel, covering a tart granny smith apple. Peanut Caramel Apple: Our homemade caramel enrobed over a tart granny smith apple rolled in peanuts! Milk Chocolate Caramel Apple: Our delicious homemade caramel over a tart granny smith apple, dunked in rich milk chocolate. It doesn't get any tastier than that! White Confection Caramel Apple: A tart granny smith apple dunked in homemade buttery caramel, then dipped in creamy white confection. Dark Chocolate Caramel Apple: A tart granny smith apple dipped in homemade caramel, dunked in rich dark chocolate. Red Cinnamon Candy Apple: Your classic granny smith apple dipped in hard cinnamon candy! Happy Birthday Caramel Apple: A tart granny smith apple dunked in creamy homemade caramel, dipped in rich milk chocolate, rolled in M&Ms and sprinkles. Rocky Road Caramel Apple: A tart granny smith apple dipped in homemade caramel, dunked in milk chocolate and topped with crunchy pecans and fluffy marshmallows. Dark Chocolate Almond Caramel Apple: A tart granny smith apple dipped in creamy caramel dunked in dark chocolate, with crunchy almonds sprinkled on top. Oreo Caramel Apple: A tart granny smith apple dipped in rich homemade caramel, dunked in creamy white confection, rolled in crushed Oreos. Gummy Bear Caramel Apple: A juicy granny smith apple dipped in creamy caramel, then dunked in rich milk chocolate and rolled in sweet gummy bears. Double Chocolate Caramel Apple: A granny smith apple dipped in rich homemade caramel, dunked in milk chocolate, then rolled in crunchy chocolate chips! A chocolate heaven. 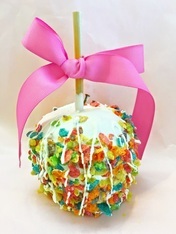 Fruity Pebble Caramel Apple: A granny smith apple dipped in white confection, then rolled in fruit pebbles. 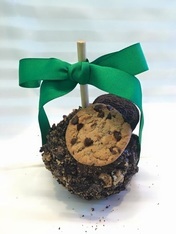 Double Cookie Crunch Caramel Apple: A classic caramel dipped apple, enrobed in milk chocolate, all topped with Oreos, chocolate chip cookies, and chocolate chips! Cookie Crumble Caramel Apple: A classic caramel apple dipped in white confection, adorned with crumbled chocolate chip cookies! Rose Caramel Apple: A tart granny smith apple dipped in creamy homemade caramel, then dipped in milk chocolate and rolled in chocolate chips, topped with sprinkles and a fondant rose. Strawberry Cheesecake Caramel Apple: A tart granny smith apple dipped in creamy homemade caramel, dunked in creamy white confection, then rolled in crushed graham crackers and topped with chocolate covered strawberries. Chocolate Decadence: A caramel apple dipped in milk chocolate, rolled in M&Ms and Oreo's.